One instance of the validation state is kept for the validation of the whole certificate chain. The state collects the certificate chain that adheres to the selected validation policy to validate data or interest packets. Certificate, data, and interest packet signatures are verified only after the validator determines that the chain terminates with a trusted certificate (a trusted anchor or a previously validated certificate). This model allows filtering out invalid certificate chains without incurring (costly) cryptographic signature verification overhead and mitigates some forms of denial-of-service attacks. Definition at line 58 of file validation-state.hpp. Definition at line 36 of file validation-state.cpp. Definition at line 41 of file validation-state.cpp. Definition at line 70 of file validation-state.hpp. 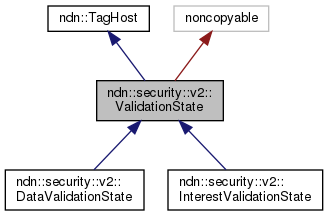 Implemented in ndn::security::v2::InterestValidationState, and ndn::security::v2::DataValidationState. Definition at line 48 of file validation-state.cpp. Check if certName has been previously seen and record the supplied name. Definition at line 54 of file validation-state.cpp. Add cert to the top of the certificate chain. If m_certificateChain is empty, cert should be the signer of the original packet. If m_certificateChain is not empty, cert should be the signer of m_certificateChain.front(). This function does not verify the signature bits. Definition at line 60 of file validation-state.cpp. Definition at line 152 of file validation-state.hpp. Definition at line 139 of file validation-state.hpp. Referenced by ndn::security::v2::DataValidationState::fail(), ndn::security::v2::InterestValidationState::fail(), getOutcome(), ndn::security::v2::DataValidationState::~DataValidationState(), ndn::security::v2::InterestValidationState::~InterestValidationState(), and ~ValidationState().